An entertaining, live-centric effect that's priced to move, Sandman will delight all but the most curmudgeonly knob-tweakers. Works as a delay and a looper. Sensibly designed, high-contrast GUI. Cheap as chips. Fun to play with. No MIDI learn. Could do with more visual feedback. 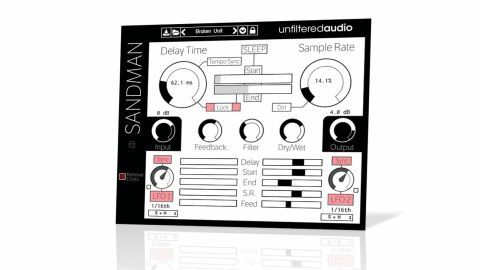 New kid on the plugin development block Unfiltered Audio has chosen to follow up its warmly received, feature-packed gate plugin, G8, with Sandman (VST/ AU), a stereo delay effect with looping functionality and LFO modulation. At the heart of Sandman's architecture (and GUI) is the buffer, to and from which the input signal is captured and played back. This can be set anywhere between 5ms and 5s, or synced to the host DAW's tempo at any note value - including triplet and dotted settings - between 1/64T and whole notes. "It's a great system for coming up with everything from rhythmic looping and dirty glitching/stuttering to dark soundscapes"
The five-second maximum buffer time still applies in synced mode, but you'd have to be working at very slow tempos indeed for it to matter. The Sample Rate of the buffer (the speed at which it records and plays back) can be set from 1-100%. When set below 100%, the result is a drop in pitch and tempo, with degradation of the signal. Additionally, activating Dirt mode adds an increasing amount of pink noise to the signal as the Sample Rate is lowered. Sample Rate is directly linked to the buffer size, so that at, for example, 1%, the buffer takes 500 seconds (100x5s) to play back its contents. If, however, you'd rather fix the size of the buffer while experimenting with the Sample Rate, the Lock button does exactly that, keeping its pitch and speed unchanged with Sample Rate adjustments, but with the signal quality still reduced as SR is lowered. The main panel also includes Dry/Wet mix and Filter knobs, the latter controlling the cutoff of a low-pass filter on the wet signal. In its default state (with Sleep inactive), Sandman is a regular stereo feedback delay, albeit one made rather more interesting by the Sample Rate dial. However, more adventurous users will want to explore the Sleep function (which freezes the delay buffer in its current state, so that it plays its contents back repeatedly until Sleep is disabled), and the effect's dual LFOs. The LFOs are accessed by clicking the arrow icon at the bottom left hand corner of the interface, which brings up the modulation panel. Here, you can set the speed of the LFOs (up to a maximum of 5Hz, depending on the Sample Rate, or syncable to host tempo), select their shape (Sine, Triangle, Sawtooth Up, Sawtooth Down, Square and S+H), and assign them to the effect's various parameters. It's a great system for coming up with everything from rhythmic looping and dirty glitching/stuttering to dark soundscapes and textural ambiences. Sandman is a no-nonsense delay and looper with a clear, high contrast interface that makes it ideal for live use. It sounds good and was stable during our testing, with no crashing or instability at all. On the down side, it could do with some visual feedback and the ability to receive MIDI - although the last is only an issue for DAWs that don't have their own MIDI learn systems, obviously, and we're told it is on the list for a future update, along with ping-pong delay and a kill switch. Minor limitations aside, Sandman is a great plugin effect that will enchant those who enjoy freeform tweaking of sounds in real time.